This weekend I decided that one of the things I am looking forward to about having children is setting up my own fava bean shelling assembly line. 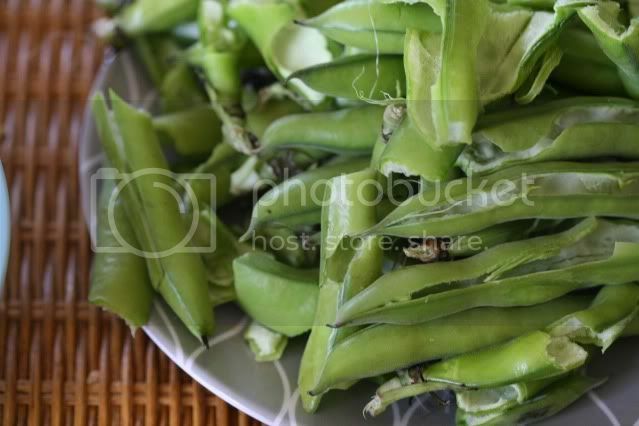 I am not pregnant, nor do I have plans to become pregnant anytime in the near future, but after working my way through two pounds of fava beans on Saturday, to be left with only a scant half cup of shelled beans, I am in need of that assembly line. There are pictures of me as a child, saddled up to the kitchen counter, dutifully snapping the ends off of green beans as my mother prepares the other and slightly more challenging components of a family meal. She was all about child labor in the kitchen and I plan on taking the same route – especially when it comes to favas. The shelling, followed by blanching, followed by peeling is a lot of work for the small amount of food you’re left with. It is worth it, but you really have to set aside a chunk of time if you’re tackling the task on your own. If there are any idle hands in your household, put a bowl of fava beans in front of them and demand help. This salad from Jamie Oliver really is worth all of the effort. The favas are paired with a fresh pea dressing and smoky pancetta. This is the first time I’ve made a salad dressing out of pureed vegetables and I’m a bit bothered that Jamie Oliver beat me to the punch. It’s a particularly great idea in this case; the pureed raw peas taste quintessentially fresh and the bright green color really pops. The fava bean prep is the most difficult part of this recipe. If you have helpers, get extra fava beans. You’ll be grateful if you have leftovers. Bring a medium saucepan of water to a boil and do not add any salt, which would toughen the favas while cooking. Add the garlic and cook for three minutes. Add the shelled fava beans and cook for an additional three to five minutes until the favas can be easily squeezed from their skins. Drain, set the garlic aside and remove the skins from the fava beans and discard. 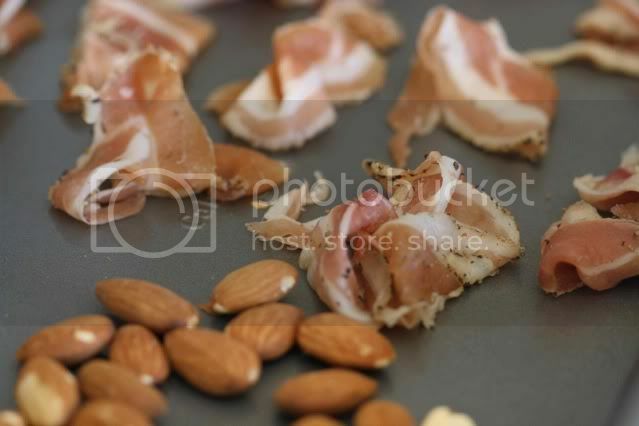 Place the pancetta and the almonds on a baking sheet and bake just until the pancetta is crisp, about 10 minutes. If the almonds start to get too dark, remove them and continue cooking the pancetta. 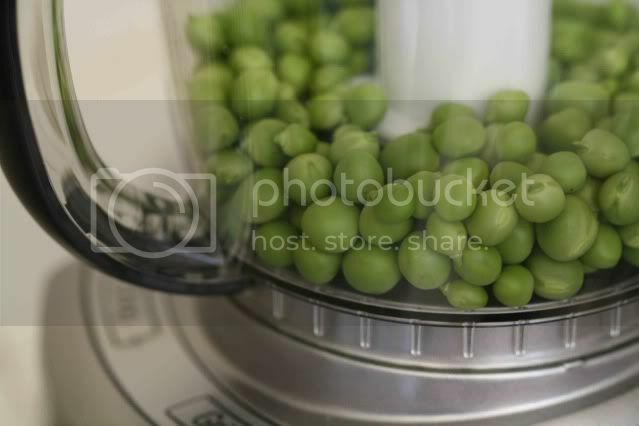 To make the dressing, place the peas and reserved garlic clove in a food processor and process until smooth. Add the cheese and mint leaves and process until combined. Add 6 T of olive oil and 4 T of lemon juice and blend. This dressing should be thick, but if it seems too pasty, add more olive oil and lemon juice until your desired consistency is reached (I added about 1 T more of each). Season with salt and pepper to taste. Divide the fava beans among four plates. Drizzle the dressing over the fava beans - you may not need to use all of it. Scatter the pancetta and the almonds evenly over the four plates and finish with a sprinkling of mint leaves and pecorino if desired. Amen to child labor at home. One of those "vicious cycles" that I'll be happy to employ - once I have young'uns, of course. This looks absolutely lovely, but a little... I don't know, scattered? Maybe it's just that I'm not a fan of salad on plates (I like them in a bowl, myself). In any case, still mouth watering. What a lovely puree, delicious! I wonder if fava beans are what we call broad beans? They certainly look like the same shell. My children are no good at the assembly line thing, they wander off after five minutes, leaving me with the hard labour. Are fava beans the same as broad beans in England? II adore broad beans. I spent many an hour as a child helping with the picking, podding, peeling etc - it's a great idea. A fava bean assembly line sounds like a good idea. I'm going to have to buy a few to see just how good that idea is (I've not shelled my own fava beans yet). I love fava beans but only cook them about once a year, due to the aforementioned labor-intensity. 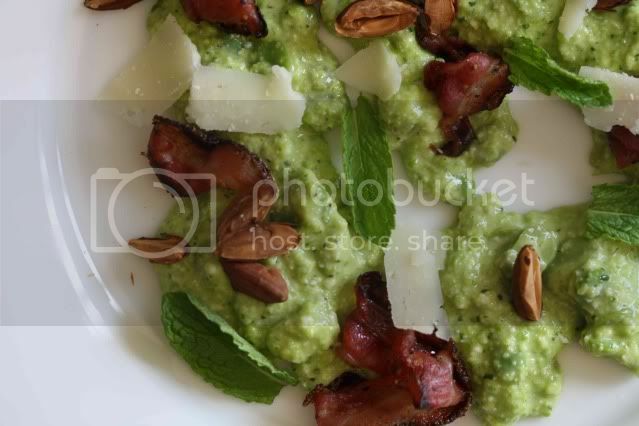 Peas, mint, almond, and pancetta sound like ideal accompaniments! Pretty! So spring like with the green and pink, the colours of cherry blossoms. I've had my children help me with pomegranates so that I could make jelly. Ten hours later with three of us working, I had 2 cups of pomegranate juice to show for our efforts. The help in the kitchen is nice! Help with holding the baby while mommy makes dinner is nice, too :) ! I know it was a lot of work, but it looks so great. Very nice spring salad. Kath and Poires au Chocolat - Yes, broad beans and fava beans are the same thing. Are they in season yet in the UK? This looks so delicious! I love fava beans although they certainly take some effort. An assembly line is a good idea. I love your photos. I love the fresh look of this salad! When I was a kid, I used to love helping in the kitchen, doing things like plucking the tails off bean sprouts and stuff. Now it's quite a chore. Thank god for already-plucked bean sprouts! Fresh fave have arrived in Rome too - I love the sound of this recipe, all the lovely textures and flavours, lovely - noted. I have been making this salad for years. It's my #1 summer salad. I cannot imagine anyone not liking this one. Gotta love Jamie! What a colorful and delicious take on the usual "salad". I would love to give this recipe a go.